Jurrasic Park, move out of the way. There’s a new pack in town! 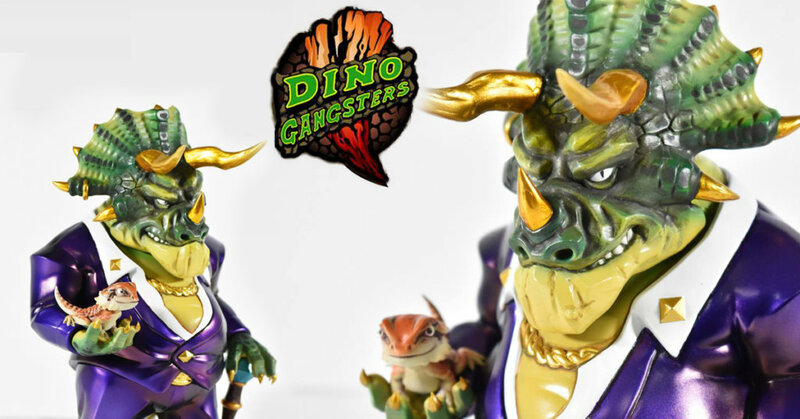 Meet the Dino Gangsters, evolution has been created from the guys at AegusToys and the first from the series will be the Kingpin Belly Black Rob Triceratops. thank goodness AegusToys didn’t go with a T-REX as the big boss man or that would be too predictable, HA. Anyway, the prototype was on display at Taipei Toy Festival back in October and judging from the reception you guys are waiting for this bad boy to be released. We don’t have any time frame of the debut for Dino Gangster Belly Black Rob from AegusToys but with the prototype in the paint testing stages already it shouldn’t be too long a wait. What we can confirm is the fact the other characters from the Dino Gangster series are already underway and being developed by AegusToys. Hopefully, the paint application and finish will be the same or equivalent to the final release seen in the photos above. Find Dino Gangster on Facebook.